You’d think, as a writer, I’d have a full stock of words upon which to draw at any given moment. Phrases prepared for, you know, speaking to other word-based life forms. Quips and witticisms locked and loaded, ready for quick-shot commentary. Words are my business. I’ve spent years thinking about them, reading them, turning them inside-out, bandying and hoarding them. 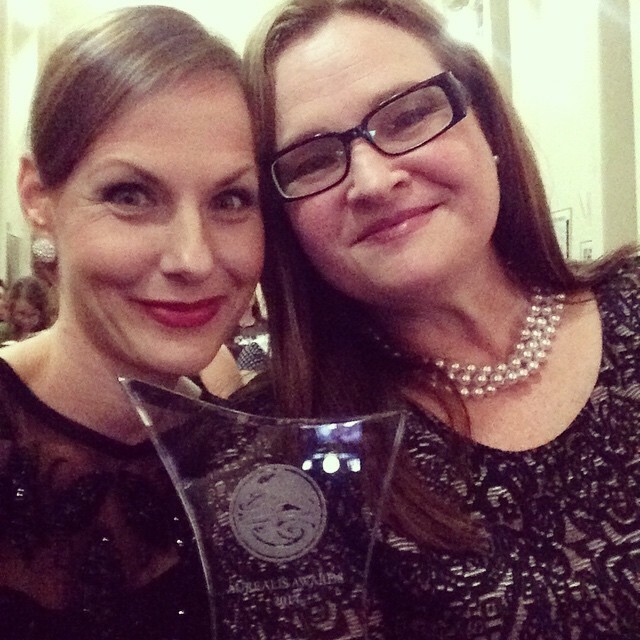 The Female Factory won Best Collection at the Aurealis Awards!! And I lost all ability to form functional thoughts, much less actual sentences. Seriously, it’s amazing I didn’t trip over on the way up to the stage. Because, in all honestly, I was convinced — utterly and truly — that it was an incredible honour to be nominated in this category, but that Angela’s solo collection, The Bitterwood Bible (an amazing piece of work!) was going to nab this award. So I flew in to Canberra at the crack of dawn on Saturday, and I spent a lovely day with Angela chatting and slothing and watching The Simpsons, feeling not even the slightest bit nervous for the night ahead because I wasn’t going to have to get up in front of everyone and speak oh no I wasn’t because I was not going to win and that was just fine just fine indeed. And then our book won. And then I turned into some weird mindless (and potentially rude) version of myself. The winner was announced and I saw The Female Factory‘s cover on the screen and then everything went silent and blurry. Angela stood up before me and over her shoulder said, ‘Do you have a speech prepared?’ — or something like that — and my mouth said NO! and I was then up at the podium (without even shaking Margo’s hand, or Nicole’s, or Leife’s — who’d presented the award) and my mind was empty but my mouth was moving, saying something about having no speech, and thanking Angela for being awesome (because she is) and thanking Chad for being an awesome partner (because he is) but I couldn’t hear anything, and Kate Forsyth and Cat Sparks were in the front row, and I was looking at their phones taking pictures, and they were smiling, and I had to pass the mic over to Angela because MY MOUTH WAS MOVING BUT NOTHING SENSIBLE WAS COMING OUT. For instance, I would have liked to thank the judges (thank you, judges! ), and Twelfth Planet Press (thank you! ), and Alisa Krasnostein (thank you! ), and the Awards organisers (thank you!) — but I didn’t. I think Angela did (mind = blank, remember) and then we sat down, and I had to put the award on the seat next to mine because my hands were shaking with shock and disbelief, and the award is fragile and sharp and pointy (and pretty!) and I was afraid of dropping it. What a wonderful, delightful, amazing, and hugely appreciated surprise! 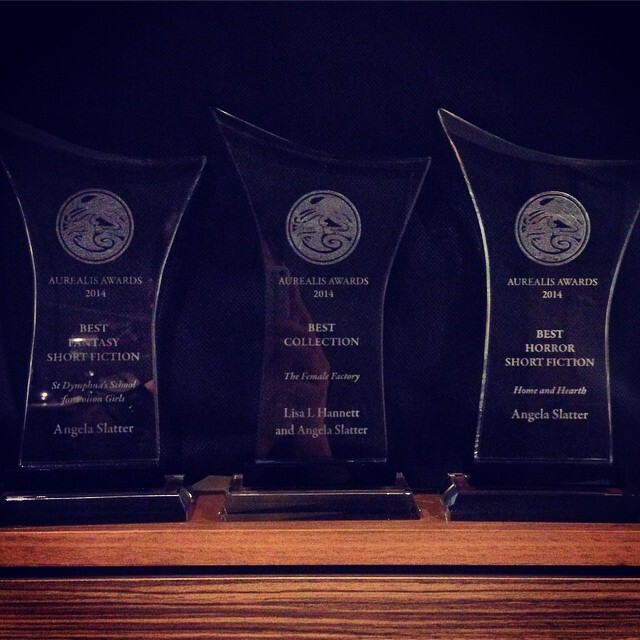 We are very proud of our collection, and so honoured to have won this award. And then the night unfolded in a sparkle of Tattinger bubbles, consumed with wonderful friends who I’d not seen in far too long. The next day, Angela and I strolled down to the National Gallery to pay the Sidney Nolans a visit and to meet up with Tehani and her lovely kids for lunch before winging back to our respective states, laden with great memories and some hardware that no doubt raised eyebrows at airport security. 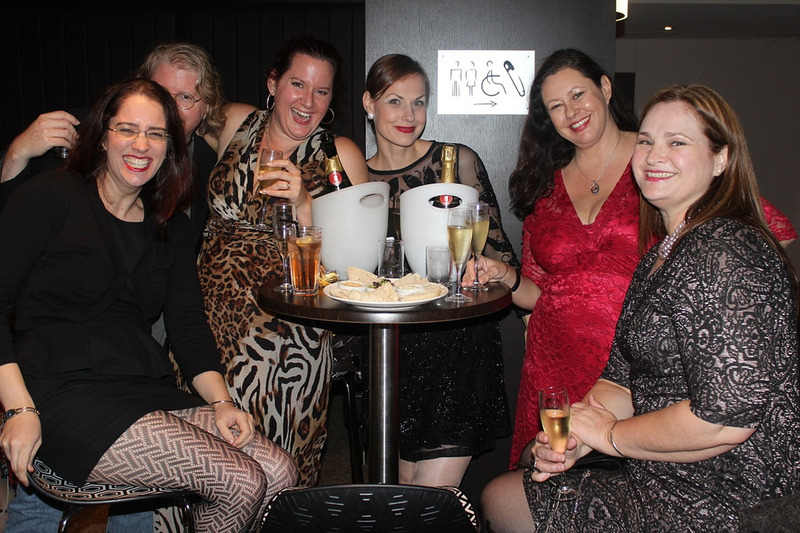 Tags: alisa krasnostein, angela slatter, aurealis awards, canberra, Cat Sparks, the female factory, twelfth planet press. Bookmark the permalink.